Semi-finished paste product used to prepare cold base mixes for homemade BLACKBERRY-flavoured ice-creams and cold desserts. Semi-finished paste product used to prepare cold and warm base mixes for homemade PINE NUT-flavoured ice creams and cold desserts. Semi-finished paste product used to prepare cold base mixes for homemade BLACK CHERRY-flavoured ice-creams and cold desserts. Semi-finished paste product used to prepare cold and warm base mixes for homemade PEANUT-flavoured ice creams and cold desserts. Semi-finished paste product used to prepare cold and warm base mixes for homemade CARAMEL-flavoured ice creams and cold desserts. Semi-finished paste product used to prepare cold base mixes for homemade COCONUT-flavoured ice-creams and cold desserts. 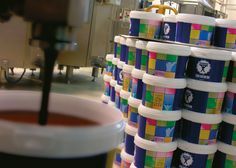 Semi-finished paste product used to prepare cold base mixes for homemade MIXED BERRY-flavoured ice-creams and cold desserts.